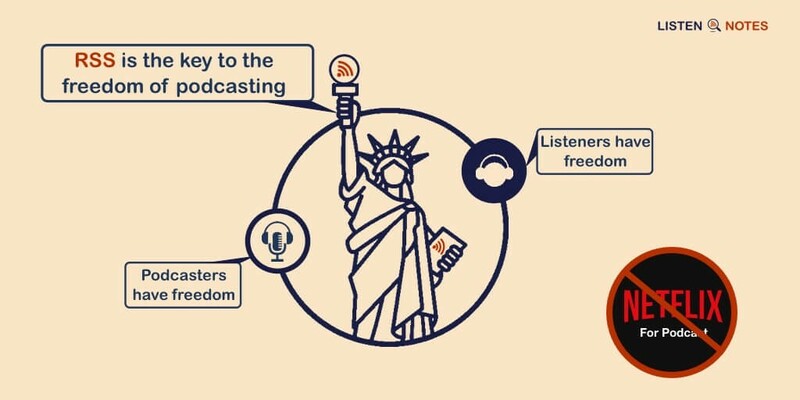 While the word “podcast” might still be a confusing or nebulous term to some people (here’s what a podcast actually is), podcasting is really about freedom — the freedom to listen to podcasts whenever and wherever you desire, as well as the freedom to create your own podcast, perhaps more easily than you think. The nature of podcasting means that folks with access to a smartphone or computer and the Internet can record their real and raw thoughts and make them available to the world. Unlike users of closed platforms that are held accountable by shareholders or advertisers — such as Netflix, Facebook or network TV stations — podcasters face more portable options. They have the choice to move to a new RSS or audio host easily. People who create content for YouTube, Facebook or via other proprietary distribution channels don’t enjoy as many choices as podcasters possess. The key is that RSS is a standardized format that works well for content distribution — and, imperfect though it may be, the RSS format isn’t controlled by a singular company. RSS provides listeners with a plethora of ways to listen to podcasts — including via podcast player apps on mobile devices, through vehicles, on desktop computers, smart speakers and more. 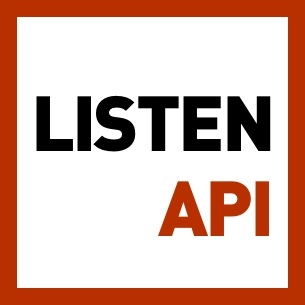 Any software that can read and parse RSS is able to handle the backbone code of a podcast episode. And if podcasters aren’t happy with their current hosting services — due to imposed ads, high fees or unstable services — they can easily move to other hosts. Due to the advances in the technology and mobility of podcast-listening, it has become much easier for the public to listen to podcasts. However, according to Amplifi Media, plenty of would-be listeners don’t understand how to listen to podcasts. Either they don’t realize they have a podcast app on their phone, don’t know how to find podcasts that might interest them — or they think that clicking “subscribe” to a free podcast means they’ll have to pay something. Listening to podcasts in a variety of ways has become so much easier. Listeners don’t need to be technologically savvy to consume podcast content these days. They can listen to podcasts on demand, without the need to download a podcast (if they so choose) anytime and anywhere they desire. Podcast listening is a hands-free and eyes-free pastime that doesn’t cost any money — it only costs time for the listener. People are also free to choose from tons of high quality podcast content. They can hear ASMR podcasts to help them sleep (seizure sufferers, beware) — along with educational podcasts that teach them new skills or ones that keep them in the know about entertainment buzz and current events. Podcast listeners tune in to gain inspiration, break through creative blocks and for many more reasons of convenience — because the medium doesn’t require hands or eyes to partake in. Podcast listening has grown easier, along with podcast creation, causing more podcast creators to jump aboard the podcasting ship. Since podcasting is a medium with a low barrier of entry and isn’t as heavily controlled as a television show, podcasters are attracted to the ease of expressing their opinions via audio. The cost of producing a podcast is low. Certain podcasters have started podcasts using just an iPhone, the GarageBand app, and cheap or free podcast hosting services. The time it takes to create a podcast can be minimal, when compared to creating a video that requires visually interesting footage — or writing a blog post that could take more time to catalogue the same amount of words expressed in a podcast. Podcasters have the freedom to pick whatever topics they desire. Interviews with podcasters reveal that it helps to be extremely passionate about your subject, as noted by the creator of the Champagne & Lobster food podcast. Certain shows are labors of love, like the podcast that helps those 50 years of age and older navigate their personal lives and careers, helmed by Richard Eisenberg. Overall, podcasters are free to record their grassroots movements to big and bold ambitions — and everything in between. With so many benefits accompanying the freedom of podcasting — along with podcast creation and listening becoming easier — it is a venue that will likely surge in popularity over the coming years. However, in spite of the spirit of freedom surrounding podcasting, there are certain firms that want to adopt a Netflix-style model for podcast listeners and creators. Several companies are competing for a leadership position in the battle to become the “Netflix of podcasts,” a venue that would offer all-you-can-hear podcasts for a certain amount of money, most likely paid monthly. But the free spirit of podcasting dictates the attractiveness that drew so many listeners to podcasts in the first place: People enjoy being able to freely search for whatever podcasts they may want to hear. Podcasts fans have fallen in love with the original viewpoints and stories heard within them. Whatever comes of the trajectory of podcasting, one thing is clear — the freedom to create and listen to a variety of podcasts for free (even unbundled podcasts) is what the public craves.